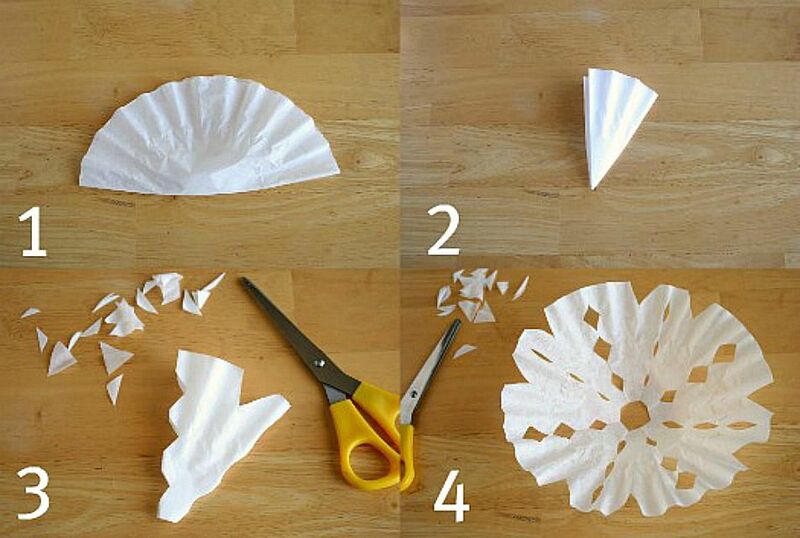 Coffee filters are great for making snowflakes because they are already in the perfect circle shape. They are super simple to handle, fold, cut, and display. You'll have so many snowflakes to hang all over the house! Fold your coffee filter in half. Fold it in half again, and even one more time if you’d like. The more times you fold it, the more fun symmetry it will have when it's done. Using your scissors, start cutting small half circles or triangle cuts out of the folds. Be careful not to cut it all the way in half or you will have two pieces, and you don’t want that! Open up your snowflake to see what you’ve created. If you need to, fold it back up and continue cutting. To make your snowflakes more interesting, you can glue embellishments onto them, add glitter, or glue them to paper for a piece of art.